Featuring a special guest appearance from Chaos Code. 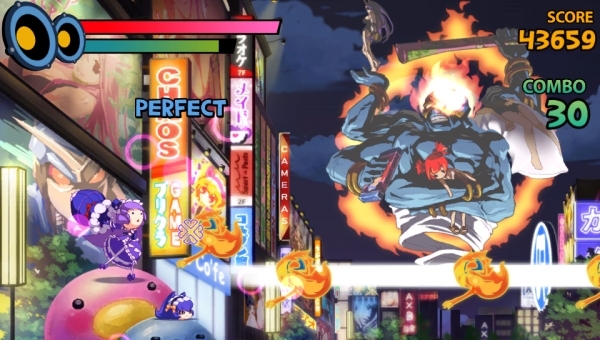 Arc System Works and Chaos Code developer FK Digital have announced Radio Hammer Station, a new rhythm fighting game for PlayStation 4 and PS Vita. A release date was not announced. A popular radio station spreading its love of groove with some of the best DJs in the world. Providing tunes to groove to throughout the day. Its true purpose is to serve as the radio station of justice, beating evil down with a ginormous hammer! To ensure peace and harmony, Radiohammer continues to go live with style! 1. Feel the Rhythm While Laying Beat-Downs on the Bad Guys! Radiohammer Station is a rhythm action game where you match your button presses to the beat of the song! Ensure peace in the world by slamming on your enemy using the power of funk! From zombies and aliens to horribly naughty perverts, the DJs of Radiohammer must face and overcome a wide variety of villainous baddies. Trouble always seems to follow the four DJs. They’re always called upon to fight the bad guys with the help of their manager and trusty hammer. Watch out for the big bosses at the end of each episode! Stay alert or you’ll get hammered by their fierce attacks. 3. Almost 100 Grooving Tunes! There are almost 100 songs, covering a wide variety of genres. From “Track Play,” which allows you to play your favorite songs, to “Random Play,” where stages are chosen for you without rhyme or reason, to the “Juke Box,” for those who just want to listen to the music, there’s something for just about everyone. Also, challenge your skill in the “Otherworld Mode,” where the game speed is much faster and the action is more intense. Achieve every goal and get all the trophies! The youngest of the Radiohammer DJs. Known for her eloquence, epic cuteness, and love of all things pop. She’ll pummel perverts into mulch with the power of cute. Programming director of the pirate radio station Radiohammer. He’s all about business and doesn’t tolerate any kind of static. Despite his youth, his appearance intimidates even the toughest of foes. Known for her insane six-string skills. Nothing, be they man, woman, or zombie, can stand up against her epic solos. Despite her love of all things goth-y, she appears to be a typical high school student. However, she is actually an android built by the scientist who discovered the energy source called “Chaotic.” She was recruited by MC Wayne after seeing her bash a bunch of gang members with her umbrella. Purchase the PlayStation 4 or PS Vita version of the game from the PlayStation Store and you’ll be able to download the other version at no additional cost. The 88-track Radio Hammer Station digital soundtrack is included with your purchase of the game.